The image, not entirely undeserved, of a large format photographer (and sometimes an assistant) slepping heavy cameras, tripods and other equipment over mountain passes may seem an anachronism to most. Cameras that use film to record images may seem an anachronism to many. These notions are not always what they seem. Though large format cameras are typically large, the 4 x 5 view camera shown on the left with a normal length lens, when folded is not much larger and can be lighter than a professional digital camera with a lens. Recent reviews of professional digital cameras suggest that the images they produce can challenge those produced on 4 x 5 film, at least in terms of resolution. The most expensive large format equipment can challenge the most expensive digital equipment in price. Large format film equipment almost universally requires manual metering, lens and shutter adjustment; digital cameras may allow manual metering and adjustment, but also provides multi-point metering through the taking lens and can be fully automatic. So are large format photographers swimming upstream in a confrontation they will envitably lose? If you have never used large format equipment or perhaps film, should you even consider this kind of equipment and media? Each successive version of Photoshop features not withstanding, there are many reasons that photographers might choose large format film photography. They may prefer the appearance of film images printed on conventional paper processed in chemicals. They may enjoy the challenge of understanding and having direct control over all the elements of photographic technology associated with conventional cameras and darkrooms. They might prefer equipment which has the same simple, universal interface--focus, set aperture and shutter speed--to having to confront five deep LCD menus that change across brands and even versions. This will not be an account of digital vs film photography, but it is a recognition that both exist and it is implicitly a discussion of what is attractive in conventional large format photography and a guide for those considering it. Large format equipment tends to be large and heavy. Typical weight for a 4 x 5 view camera with a 6-inch lens is 5-7 pounds, plus a 4-5 pound tripod and several pounds of additional equipment--extra lenses, filters, meters, film holders. Although there are options, composition is usually on ground glass with the image upside down and reversed. These costs are incurred before you see the result and can't be recovered. Black and white processing is relatively simple and only moderately expensive; color processing is more complex. A wet darkroom, obviously requires a room with plumbing, and at a minimum several hundred dollars worth of equipment, including an enlarger. Alternately negatives and transparencies can be scanned and printed digitally. Typically, little of your digital or 35mm equipment will be very useful to your medium and large format excursion. Image Quality. The comparison of film to digital image quality is complicated and constantly shifting. Many find that in color work there is little if any advantage in using film over digital. Negative film materials have considerably more exposure latitude than positive film and digital pickups and at least to this point, can provide better black and white tonal gradation. What follows is the traditional argument for larger over smaller film images. A 35mm frame is 864 square mm, a 6 x 9 cm negative has 5400 square mm, and a 4 x 5 in negative has 12,500 square mm, nearly 15 times the area of the 35mm frame. The less you enlarge the image, the less you magnify its flaws. Lens aberrations are enlarged along with the image, so as negatives get larger, the effects of lens aberrations are reduced, assuming similar quality lenses. Tonal gradation, that highly prized quality of B&W photography, improves with reduced grain. 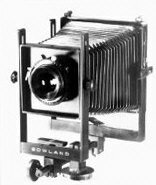 Most large format cameras allow for some amount of movement--raising or lowering, tilting or sliding--of at least the front standard and often the back standard to control perspective distortion and plane of focus (much more about this later). Shooting styles. Modern cameras with motor drives, metering automation, autofocus lenses and image stabilization are great for action shots. They catch the moment in ways that are difficult or impossible when using typical large format equipment. This automation is seductive but it leads to choosing this shooting style for all kinds of subjects--even those that don't require this kind of responsiveness. Visualization--knowing what you want a shot to be before you look through a viewfinder or ground glass--increases the probability of a good shot, but chance plays an important role in the work of even the best photographers and bare ground glass can be a hair shirt as much as an aid to photographic vision. Large format photography promotes a more deliberate style of shooting. It works best where setup time is not a major restriction--for example in architectural, landscape, still life and most nature photography, except perhaps shots involving animals.